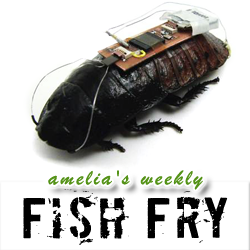 This week’s Fish Fry has it all – remote-controlled cockroaches, Raspberry Pis, and some design verification thrown in for fun. I dig into the details of a new neurostimulation system designed to create cockroach biobots, why getting your hands on a new Raspberry Pi computer may get a whole lot easier, and why verification is one of the most challenging engineering problems today. I interview Dave Rinehart (Vice President, Aldec) about how to solve your verification struggles, how Aldec is carving out a nice slice of the EDA pie, and what meal Dave is most famous for. Also this week, I give everyone one more chance to win a copy of the book “Mixed-Signal Methodology Guide” courtesy of Cadence Design Systems, but you’ll have to listen to find out how to win.